Art prints of A Stranger Dream have arrived – these are wonderful – I am really chuffed with the quality and I have found some black frames which work really well with the images. 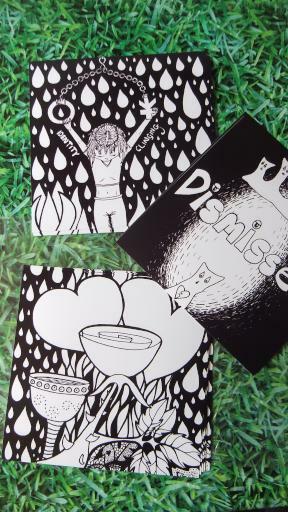 Currently there are only three designs: Dismissed, Identity Clinging and Love. As these sell I will have enough capital to get more made but it is going to be a slow roll out – sorry guys! Also I am not currently selling things online other than the book itself which you can get through amazon. The reason for this is that the after affects of head bang make it still a bit too much for me but I am selling them at events. I am a poet, I am an artist, I am many things some of which seem contradictory – after the head bang last year the question of identity reigned large in my vision of self – not just my identity but everybody’s and societies reactions to identity issues – so I started working on a series of images. I was learning how to draw again and the ideas were appearing faster than I could create them, I spent 3 months working on the visuals for A Stranger Dream. And mainly I have had positive feedback though some people do hate the style and that is fine it is stark, it was meant to be. It is a non-linear visual poem on identity, gender, our place within family, our concentric non-ecludian intersecting and exclusionary circles of all the cultures of us – it is the distorting mirrors within our own heads – the fitting and the not fitting – the fires within. I know it doesn’t look it but it was a hell of a lot of work. Then someone said “it says colouring in book to me” and I thought… why not?! I thought people colour to relax, to sort thoughts, to just be themselves and that is fitting – plus colouring in book is on the list of to-dos and I have been producing colouring in sheets for my kids workshops for ages. So I started by popping the images up as individual sheets for download and colouring – they are still there and they are free. Then I made ring bound ones at home for shows and events… people far away started asking how they could get hold of them so I have created a colouring in book complete with purple spine and title box because… I am the Purple Poet!!!! 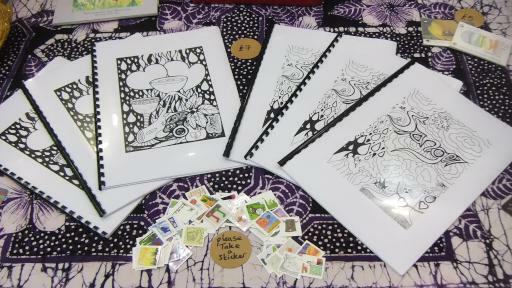 Here is a picture of the spiral bound ones at The True Believers Comic Book Festival earlier this year. And this weekend (April 22-14 2016) I am having a launch party – sadly I am only running a virtual one but it is going to be epic!!! I will be pinging around the internet – of course hoping people will buy the book but as I said don’t feel you have to because I put the individual sheets out there for free download and I know times are tight (having said that I need to buy more art supplies… to you know produce more art!). There is a Facebook Event, a Google+ Event, a twitter hashtag # astrangerdream and my patreon account (which will have hidden extras in it for patreons only). 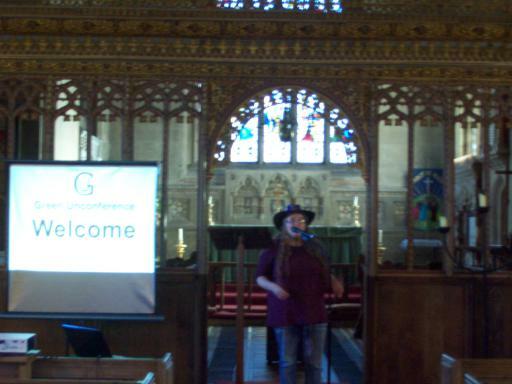 There are also the blogs namely this one and Turquoise Monster which is my poetry blog So I think that is pretty much everyone covered – I am hoping to do a little film thingy too but we will have to see how the laptop holds up! There are going to be give aways but there will also be merch for sale and special offers etc… (sorry guys I would love to give you everything for free but I do need a new computer!). Most of all though regardless of weather you buy or take for free or just look – mainly I hope everyone will be enriched by the work itself, it was very important to me whilst creating it. It’s kind of an imprint of the soul, maybe a darker one than people would like but it is… something – I’m not quiet sure what. 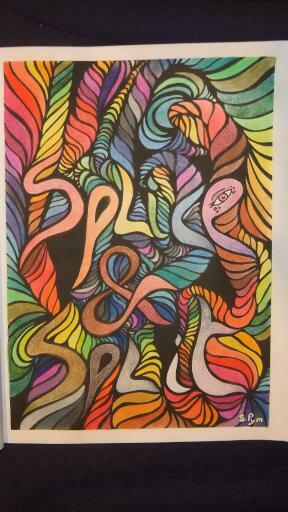 I hope you will join me for turning the starkness into a rainbow. The challenge as set by Margareth Osju and is to draw 100 birds in 100 days – I am off course already lagging behind but hope to catch up! There is a Google Plus circle and Margareth’s blog. I shall be posting the pictures on my Picture Books and Illustrations blog Orange Monster. This first one has been done as a request for my husband, most of the drawings will not be this style at all. 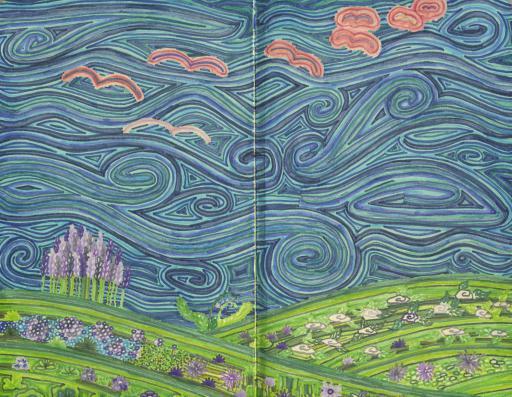 The picture is called Gaia and is part of my visual poetry journal. 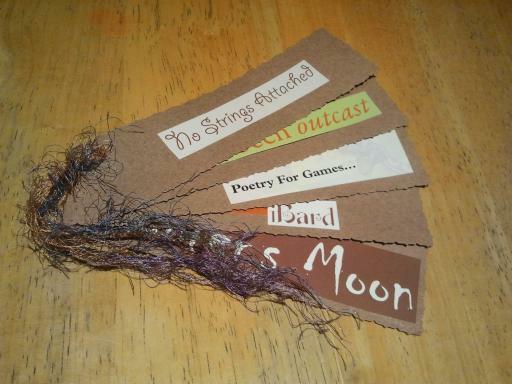 I made this little Visual Poetry booklet as a source of inspiration to other poets and writers I meet up with. I looked through magazines and selected the words I wanted – chosen for what they said and the type face used. I then cut strips of card using the bell scissors out of my shape cutting scissors. 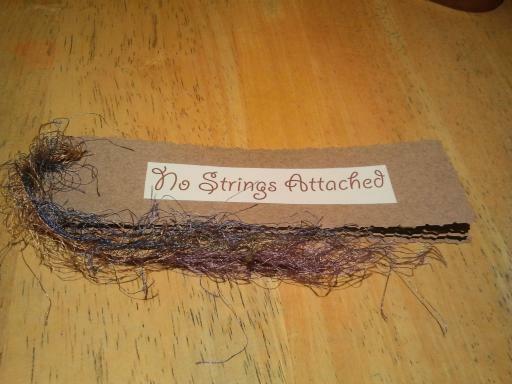 I punched a whole in the corner of each strip using a whole punch, using pritt stick I glued the words onto the card strips and selected some lovely varigated coloured eyelash wool which I used to tie it together. Apart from that I have quiet a full year planned – I am hoping to be booked for more festivals and am going to be running a Science Art Exhibition at Centre Arts in Cheltenham. And then there are the books I want to make. I’ve been mucking around with various Print On Demand things and have three books I want to create were Art and Craft are concerned. I have come away saddened but optermistic and re-energised about the stuff I do to try and be a bit more friendly to the planet. Everything from government policies to how to garden to how to save/use waste food to feed those who are increasingly needing to use the food banks in this country was covered. I myself did an Upcycling and Junk Art workshop – complete with a mini talk and slides. It was the most gorgous setting for a workshop and I had my visual poetry stuff with me as well which a couple of people stayed on to do as a mini workshop. The workshop was making a vase of flowers out of old magazines. My little girls were about as well behaved as I think I could realistically expect :/ I think Jeany eat most of the buffet before we officially had stopped for lunch! 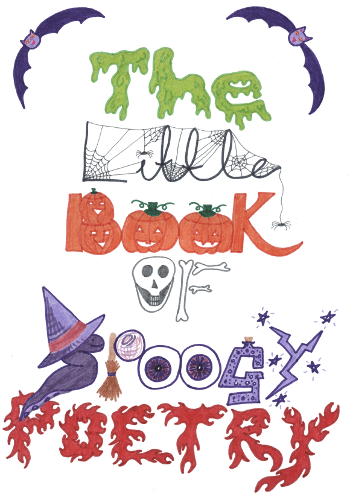 And talking of e-books don’t forget to download your copy of The Little Book of Spoogy Poetry before midnight on the 31st of October! Click the image below for your free PDF. Image is a link to a free PDF of the book! A few years ago to entertain my then just turned 4 yr old I wrote a series of kids poems and we made a little book with me handwriting the poems and drawing some quick pictures in felt tip pen. My little girl liked it so much she took it to school with her where to my embarassement the head master saw it and thought it was great. I typed up the poems and took photos of the book assembly – for this blog and thought that was the end off it all – especially when the book got a cup of water spilt on it (much to my annoyance and the tears of a little one). 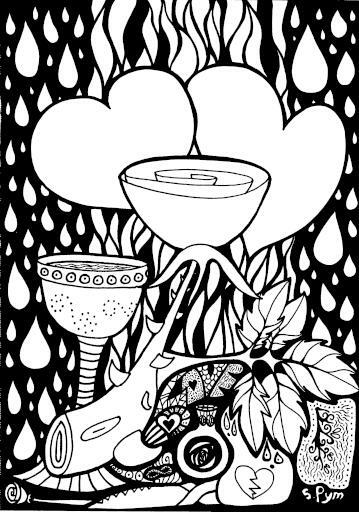 But I then ended up writing a Little Book of Poetry for all sorts of other events and festivals like christmas and the birth of my second child and to stop the heart ache of the first ones destruction I scanned the pictures I drew. People kept telling me that I should release the books but I thought I should digitise the pictures so I spent ages trying to draw the pumpkins and things but I found that it just came out looking like a cheap hobbled together image and that was not what I wanted. Then I came to the realisation that this was not needed and that the felt pen look was a good for kids books. So I drew pictures and have run them through a few filters and things to clean them up etc… (I found that different sketch books have slightly different coloured paper in them which needed to be sorted etc…).